New England does not create much pressure up front, but Trey Flowers is one of the best young edge defenders in the league and by far the most consistent presence along the defensive line for the Patriots. He’s been dominant in the two playoff games and now has 72 pressures (eight sacks, 23 hits, 41 hurries) on his 537 rushes this season. 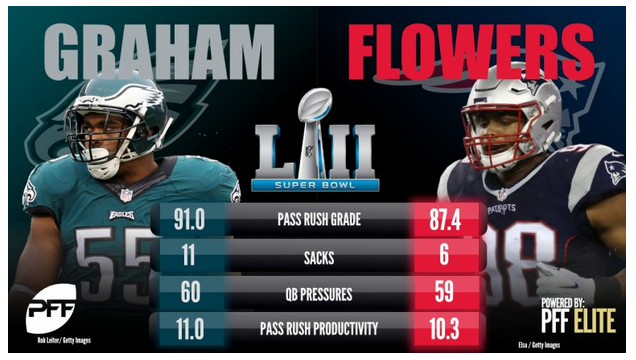 Flowers will line up all over the formation, including a few snaps directly over the center as a pass-rusher, but Halapoulivaati Vaitai may be the most favorable matchup when it comes to creating pressure. He’s surrendered nine sacks, 12 hit, and 22 hurries including the playoffs, and that performance sticks out on one of the league’s best lines. Overall, Vaitai has had a number of impressive games in place of All-Pro tackle Jason Peters, but he’s certainly not at Peters’ level and the Patriots may see what their best pass-rusher can do against him in must-pass situations.